Caritas Swaziland is the extended arm of the Catholic Church, which is a non-discriminatory and voluntary organization that is entrusted by the Church with social responsibility. The organization has seven programs namely; Orphanaid welfare, Food security and rural development, Hope House, Home based care, Justice and Peace, Micro-Projects and the Refugee section. These provide different services to the Swazi nation as well as other nationalities most particularly under the Refugees section. This report however is concentrating on the Orphanaid welfare which receives quarterly subvention from Government to implement various projects in order to assist the families who have lost their economically active heads. These projects include Education assistance (school bursaries), Shelter improvements, Backyard gardens and Feeding and clothing of vulnerable children in Neighborhood care points (NCP) and in local schools. The Government subvention helps the program to implement the various projects. There are 62 Neighborhood Care Points (NCPs) under Caritas supervision, and each NCP has 5 Caregivers which makes a total of 310 Caregivers. 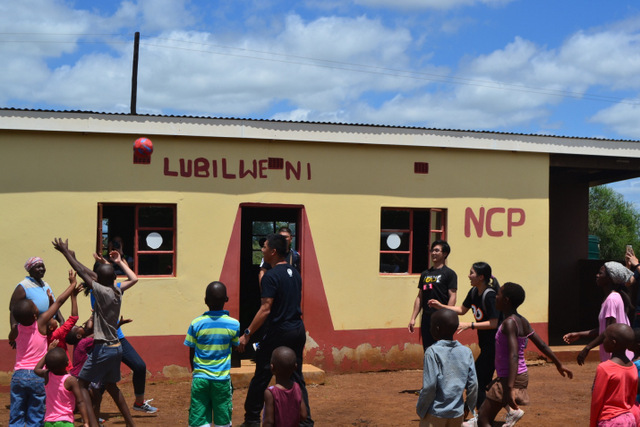 The NCPs are all located in the Lubombo Region in four constituencies namely; Lugongolweni, Mpolonjeni, Matsanjeni North, Lomahasha and Tikhuba, and supports 2 725 children: 1 121 boys and 1 314 girls. The children get services like informal education (517 children joined Grade 1 from NCPs), feeding, health hygiene, psychosocial support and Early Childhood Development Education. The Caregivers were trained in all these areas, and the last training they had was on human trafficking.